The Nolan family’s New Millennium Reunion could have been held in a phone booth. Despite years of planning, only two of the several dozen living descendants of Lewis Elmer Nolan and Bertha Orpha Miller Nolan made the trip to Cass Lake, Minn., to observe what would have been the Centennial year of the long-dead couple’s wedding anniversary. grandparents. Both Jim and I are namesakes of our grandfather. The name “Lewis” was also carried by my late father, Lewis Earle Nolan, MD, and still echoes down the generations. 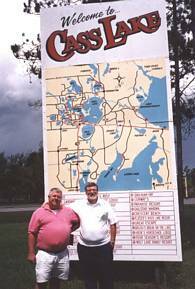 Jim and I were accompanied on our pilgrimage to Cass Lake in the summer of 2000 by our wives. My wife of 32 years is Betty Trapp Nolan, a high school teacher in Memphis. Jim's wife of 29 years is Carol Jane Tennant Connor, director of public libraries in Lincoln. Mary Nolan Ballard, now 69, of St. Petersburg, Fla., my half-sister and the eldest living grandchild of L.E. and Bertha, had very much wanted to join us in Cass Lake. But poor health prevented her from making the trip. We three are among the 14 grandchildren of Lewis Elmer (L.E.) and Bertha whose identities I know. My late father was Lewis Earle Nolan, MD, who had a roving eye. His five marriages and other possible relationships raise the possibility that L.E. and Bertha had more than the 14 grandchildren I know about. I’ve been told about the existence of yet another family headed by my father (this family supposedly lived in Chicago long before he married my mother), but the details have been withheld at the request of the supposed children and I have yet to come across any confirming documentation. Lewis Elmer (known as “L.E.”) Nolan was the youngest son of Civil War veteran and Irish immigrant John Nolan and Bridget Reynolds Nolan of Ridgeville Township, Wis. His bride was Bertha Orpha Miller, the youngest daughter of Dr. Haschall Phelps Miller and Orpha Hinman Miller of nearby Norwalk, Wis.. 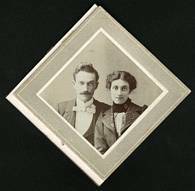 The couple married April 12, 1900, in Tomah, Wis. According to their nephew, the late Donovan Nolan of nearby LaCrosse, Wis., the ceremony was a double wedding that also married his parents, Levi “Lee” Nolan and Mamie McGary. The four members of the wedding party were all residents of Monroe County. The county in Southwest Wisconsin was the site of the John Nolan farm in Ridgeville and also the town of Norfolk, where Bertha’s father practiced medicine. As detailed in my book, “Nolan-Miller Family History” published by Highland Press in 1997, L.E. Nolan was a railroad man his entire working life. A summary of his life and that of his wife, Bertha, is posted on a sister website at lewis_nolan/LE.HTML. Great Northern and Soo Line railroads in Minnesota, North Dakota and Wisconsin. He was transferred to Cass Lake by the Soo Line in 1914, where he became station agent. He lived and worked there until his death April 28, 1939, at the age of 69. Bertha’s primary residence continued to be Cass Lake until her death Feb. 23, 1959, at an age variously put at 77, 81, 85 or somewhere in between. I hadn’t visited Cass Lake in more than 40 years. My last visit came in 1957, when I was 15. My father drove me there from Hancock, Mich., after his fourth wife – Dorothy Rae Smith Nolan - kicked me out of their palatial home in the middle of my sophomore year of high school. My memory of the visit to Cass Lake is sketchy, but I do recall spending the night in Grandmother Bertha's two-story, wooden house and being taken to the cemetery to visit the graves of my grandfather and one of his children. I was then put on a train to Sacramento, where I rejoined my mother and two brothers, ending a stormy stay of six months with my father and his wife du jour. My cousin Jim likewise hadn’t been in Cass Lake in 18 years. But I soon found that his memory of the place where he spent much of his boyhood is sharp. Jim served as our tour guide, local historian and chief conductor of our trip down memory lane. He and Carol were also our charming luncheon and dinner companions during our four days in Cass Lake. As with other trips recounted in “Nolan-Miller Family History,” I kept a travel journal to record my impressions and thoughts about the places visited. I especially wanted to be the “eyes and ears” for Mary Nolan Ballard, who has made so very many contributions to keeping our family history alive and well documented. The following journal is dedicated to Mary, whom I hope is one day able to travel to Cass Lake to pay homage to the memories of our grandparents and to deepen her appreciation and fascination with the history of the Nolans, Millers and related families. After seven years of talking it up and trying to plan a family reunion in Cass Lake as a follow-up to our 1993 gathering in Monroe County, Wis., I arose just before 3 a.m. this morning to get ready for the journey. Betty and I had booked a 5:20 a.m. Delta flight from Memphis to Minneapolis, connecting through Atlanta. It was definitely a round-about way to get to Minnesota from our home in Memphis, but the inconvenience was offset by a cheap fare, roughly half what the direct Northwest flight costs. Betty and I had first planned to drive, thinking that we’d take a few days on either side of the Cass Lake gathering to visit St. Louis, Chicago and perhaps a few places in Wisconsin. However, no interest in a reunion event in Monroe County ever emerged, so we decided to eliminate the side trips and about four days of driving. I was surprised and disappointed at the lack of interest since about 30 descendants of L.E.’s brother, Lee Nolan, lived in or near Monroe County and had participated in our 1993 gathering. Moreover, the timing of our 2000 gathering was driven by the 100th anniversaries of the double weddings. I really can’t fault the Wisconsin Nolans or any other branch of the family for not participating in the 2000 event; the lack of enthusiasm for family history is widespread in our bunch. Other than a few spots of lukewarm interest here and there, there are only a very few of us who seem to care passionately about the family history. Mary (a devout Morman) is the one who carries the largest banner in our tiny parade. I’ve found that relatives generally tend to ignore or humor me when I bring up the subject of genealogy. However, I understand that is not unusual since the norm seems to be one genealogist per family. The flight to Minneapolis was the best kind, uneventful. Because of horrendous delays with baggage on our last Delta flight, Betty and I traveled light and carried our bags on the plane. We arrived just after 10 a.m. and were greeted by a large terminal expansion construction project, which had us lugging and tugging our bags through what seemed like a mile of maze-like, temporary passageways to the Avis counter. Our rental car for the 245-mile drive north to Cass Lake was a full-size, Chevrolet Lumina. Minneapolis was where my late father, Lewis Earle Nolan, MD, received his college degrees and worked early in his medical career. His eyesight kept him from accepting an appointment to the U.S. Naval Academy in Annapolis. Consequently, he entered the University of Minnesota in 1920 and the university’s medical school in 1922, where he obtained scholarships, his BS degree in 1925 and his doctor of medicine degree in 1927. Lewis lived for a time in a boarding house near the campus while going to college. He used his father’s railroad pass for frequent trips home to Cass Lake. He also shipped his laundry home via rail to be washed, probably a benefit of having a station agent for a father and a doting mother who helped him pinch pennies. My father practiced medicine in Duluth for a time and returned to Minneapolis in 1930, where he studied pathology at the University of Minnesota and worked as a pathology assistant and instructor until 1939. By this time he had married for the second time, to Louise Abigail Stephenson, a nurse he had met at the Duluth hospital where both worked. His first wife, Viola Evelyn Nelson, left him; there were no children from that marriage, according to his late brother, Donald Edwin Nolan, MD, also a Minnesota graduate. Betty and I drove by the main campus of the University of Minnesota, long renowned for its medical school and affiliation with the Mayo Clinic of Rochester, Minn. But we didn’t stop there or even at the world’s largest indoor shopping mall just outside of town. Our time was limited and the focus of this trip was on Cass Lake. Stephenson Nolan lived with their children. Their eldest living child, my half-sister Mary Nolan Ballard, had asked us to take some photos of her former home and I was happy to oblige. She made it easy to find the house by providing specific driving instructions, courtesy of an Internet map site. The Nolans lived in a two-story Tudor house that still stands at 5015 13th Avenue. It is in a charming, settled neighborhood not far from downtown. The home is near several parks and a golf course. Mary lived there until 1939, when the family moved to Oak Park, Ill., near Chicago, following transfer of Lewis to the Hinds Veterans Administration Hospital. Louise unilaterally moved herself and three living children to St. Petersburg, Fla., in February, 1940, where Louise lived until her death in 1988. Louise had insisted on escaping from the Northern winters after she came down with pneumonia. Lewis stayed behind and eventually relocated to West Virginia, where he met my mother, Garnett Elizabeth Ford. She became his third wife in 1942. Mary was 7 years old at the time her mother packed her, brother James, 6, and sister Abigail, 15 months, off to St. Petersburg. But Mary well remembers her life in Minneapolis with fondness and recalls the names of her neighborhood playmates (her best friends were Peggy Twomey and Donna Nystrom). 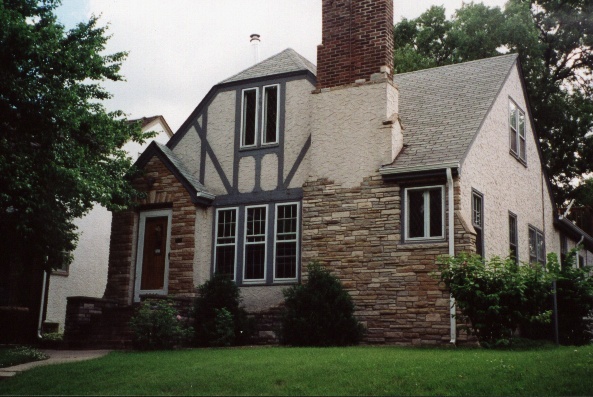 Ironically, there was a resemblance between the Minneapolis house - made of brick with stucco and exposed timbers in the Tudor manner - to my mother's house at 1517 41st Street in Sacramento, where I did most of my growing up. The two houses are in established neighborhoods and are of the same architectural style. The similarity is not exact but it is close enough to make me wonder whether my father had chosen both homes or whether his second and third wives (respectively Louise Stephenson and Garnett Ford), had similar tastes. After all, they married the same man. And both had studied nursing. And both liked warm climates.